From Chinese wontons to Russian pierogis, there is something innately satisfying about wrapped savory mixtures. Egg roll wrappers and spring roll skins are two commercially available exteriors used for wrapped Asian appetizers. 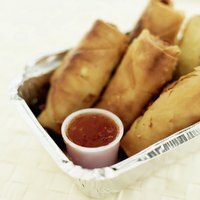 There are two kinds of spring roll skins: those that are essentially the same as egg roll wrappers, and those that are typically used for fresh rolls. Egg roll wrappers and spring roll skins for cooking are made from wheat, while spring roll skins for fresh rolls are made from rice and tapioca flours. Both the wheat and the flour wrappers are easy to use, once you get the feel for them. Egg roll wrappers and wheat spring roll skins are meant to be deep fried after they are filled. Rice paper spring roll skins are typically eaten uncooked, although they are sometimes fried as well. Although rice paper spring roll skins for fresh rolls are not actually fried, they are dipped in warm water to soften them and make them flexible enough for rolling. The filling wrapped in an egg roll wrapper or wheat spring roll skin is precooked, and then heated again during the deep-frying process. Traditional filling ingredients include cabbage, onion, ginger, garlic, pork, shrimp and tofu. Fresh spring roll fillings usually include a mix of cooked and uncooked ingredients, especially rice noodles, pork, shrimp, shredded lettuce, and fresh herbs such as mint, cilantro and Thai basil. Whether your filling ingredients are cooked or raw, they'll hold together best if you drain out as much liquid as possible before wrapping them. To roll filling in egg roll wrappers or wheat spring roll skins, spread an inch-thick layer of the mixture an inch or two from the edge of the wrapper closest to you. Fold the flap closest to you over the filling, fold the sides an inch or two towards the center, and then finish rolling from the bottom to the top. Use a thin bead of water or water mixed with cornstarch to seal the roll. Rice paper spring roll skins can be rolled in essentially the same way despite the fact that they are round rather than square. However, the skins are sticky enough to adhere to themselves, making water or corn starch unnecessary. Egg roll wrappers and wheat spring roll skins must be stored in the refrigerator or freezer. They are a perishable product, and will have an expiration date if they are sold refrigerated rather than frozen. Store unused wrappers in a sealed plastic bag after opening them to keep them from drying out. Rice paper spring roll skins are shelf-stable, being essentially a type of dried pasta. Store them in plastic as well after opening them to keep them away from moisture. Are Wonton Wrappers Made With Rice Flour?